Laid Off Loser: Laid Off Loser Album of the Day: "Mingus Ah Um"
Mingus, man. What a cool cat. A badass bassist, a killer composer, a mad genius, a raging soul. 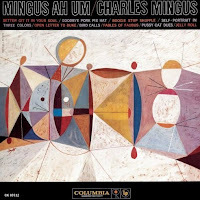 If you need an introduction, you can't go wrong with Mingus Ah Um, presented here in a two-disc set that includes bonus tracks, alternate takes and Mingus Ah Um's equally adventurous followup, Mingus Dynasty, culled from the same 1959 recording sessions. One of the most daring jazz musicians of his era, Mingus is nonetheless overshadowed by free jazz pioneer Ornette Coleman. But the directions Mingus took hard bop composition and improvisation were no less phenomenal and influential. Mingus Ah Um is a prime example, widely regarded as one of (if not the) best Mingus albums. While infused with the blues, Duke Ellington and Jelly Roll Morton, Mingus Ah Um is not your typical late-50s hard bop record. It's a raw, unhinged expression of sound peppered with primitive gospel howls, big band bombast and manic, Middle Eastern-tinged flare-ups. It's a wild ride — tailor-made for screaming down the interstate in the middle of the night — that moves from hellfire testifying ("Better Git It In Your Soul") to bluesy 3 a.m. regret ("Goodbye Pork Pie Hat"), then back to pure propulsion "Boogie Stop Shuffle" before another smooth downshift (the sweet and somber "Self-Portrait in Three Colors") and on and on and on. Along the way, the thing never loses its swing or effervescent cool — it's like an acid-dosed imaginary score to a Raymond Chandler novel. Damn straight better git it in your soul.